Nikon extends its range of SnapBridge-compatible cameras with the D5600, a mid-range DSLR designed for hobbyists who want to explore the creative world of photography. 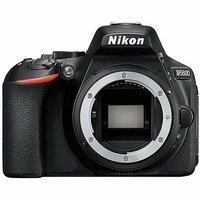 Like its predecessor, the D5600 uses the same 3.2" vari-angle touchscreen, 24-megapixel DX-format sensor, EXPEED 4 processor and 39-point AF system. It also comes with a host of new features, including time-lapse movie mode, Bluetooth and NFC connectivity, and enhanced touchscreen functionality.